The Workshop Dxb is a printmaking initiative, specialising in custom, hand pulled screenprinting. The Workshop Dxb offers a comprehensive one-on-one screen printing environment, ranging from the smallest prints to large format printing. Their background in design, allow them to work on customer files and make the necessary adjustment to reach the target. Minimum orders apply only to screenprinting and are dependent on the job. 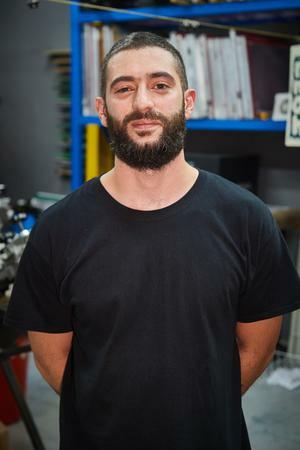 When childhood friends Ahmad Makary and Moe Krayem came together more than seven years ago to experiment with an old, hand built silk screening machine, neither of them expected it would be the start of a long, creative venture. Joined by an urgent curiosity to learn a new craft and a passion for the DIY culture, they quickly found themselves answering to an increasing number of orders from friends and family. It was the birth of The Workshop, born in Beirut but now based in Dubai. While The Workshop has come a long way from the small streets of Lebanon’s capital, its spirit remains intact. Across the UAE, the workshop has long worked to keep the creative DIY culture alive in the Middle East. Beyond growing a strong network of reputable clients in the region, The Workshop has maintained a public presence by taking silk screening to the streets, hosting live printing activations at events across the country – from small music festivals to large beach raves. The Workshop’s large portfolio ranges from textiles to paper prints, corporate runs to start-up collaborations. Now experienced print makers and avid craftsmen, the founders of The Workshop look forward to sharing their craft.